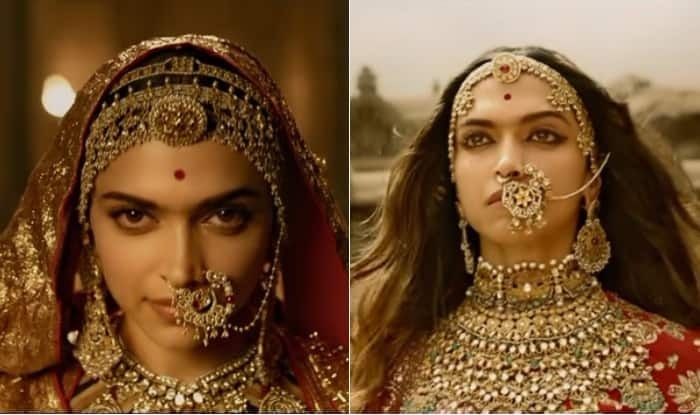 Sanjay Leela Bhansali directs Deepika Padukone, Ranveer Singh & Shahid Kapoor in Padmaavat, the cinematic adaptation of the opera that Bhansali was invited to direct in 2008 which is based on a 1540 poem by poet Malik Muhammad Jayasi. The epic poem tells the story of the beauty and valor of Princess Padmavati of the kingdom of Singhal who later becomes the queen of Mewar, the pride of Rajput king Raja Ratan Singh and the lust of Allaudin Khilji. Deepika plays Rani Padmavati, Shahid plays Raja Ratan Singh and Ranveer plays Allaudin Khilji. The movie has courted enormous controversy and walking out of the theatre I couldn’t understand why. If anything this is a movie that ought to be cherished by the very people who are protesting in the streets. It glorifies the Rajputs of ancient India who never gave into the Mughals. Those who threatened bodily harm to Deepika for what they deemed mischaracterisation of the queen goddess owe her an unconditional apology. Her portrayal as the proud Rajput queen would make any Rajput walk two feet taller. Ranveer Singh brings a barbaric, manic and frenetic interpretation to Allaudin Khilji. There is an animalistic madness in his eyes and he tends to push it a little too far with that misplaced dance number but overall at no point do you sympathise with this lustful power crazed barbarian who thinks he owns the world. Ranveer is competent as ever and it is indeed hard to imagine any other actor being able to pull off a character so over the top. 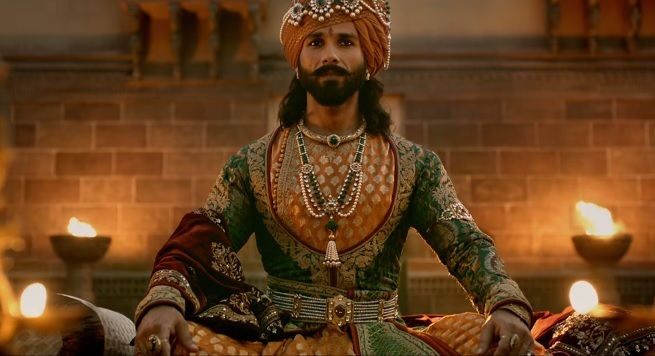 Shahid Kapoor is stoic and regal as the king of Mewar. Even when he is besotted with his beloved Padmavati he does not put on school boy airs. He carries himself with such grace and dignity and presents a polar opposite to Khilji. His words are measured and his intense gaze does most of the talking. Deepika Padukone is fantastic and back to top form. After a brief Hollywood stint the queen is back to rule Bollywood. To be laden with such opulent costumes and jewellery that probably weighs more than her she still manages to shine through from under all that Bhansali extravagance. The doe-eyed beauty transforms into goddess-incarnate filled with raging pride when she delivers the final sermon. Her walk to the jauhar pyre will give everyone the chills. The story while loosely based on an epic poem does not shy away from topics that most other directors would either have swept under the rug or made a caricature out of. Take for instance Khilji’s penchant for effeminate boy-slaves. Jim Sarbh plays Mallik Kafur who seems infatuated by Khilji. Aditi Rao Haidari plays Khilji’s cousin who he marries and mistreats. Anupriya Goenka who plays Nagmati, Ratan Singh’s first wife leaves a lot to be desired. A strong seasoned actress would have elevated the one scene where she is supposed to be have shined. 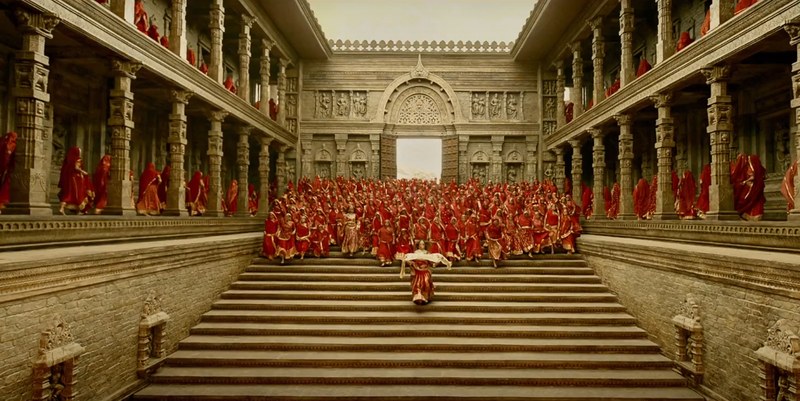 Sanjay Leela Bhansali is a visual maestro – every frame of his is visual poetry. Every detail is meticulously crafted. The oil-lamp lit vistas of the Ghoomar song are jaw-dropping. Small nuances like the small pool right outside the private chambers, the carvings of hands outside the temple – these are details that anyone who has visited Rajasthan can attest to as being authentic. However the controversy surrounding the movie which began from the very first shoot must have weighed heavily on the director’s mind. The screenplay seems flabby at the start. The pacing is off. The scenes between Khilji and Ratan Singh too long and too repetitive. He manages to rouse the passions towards the second half and pulls it all together visually and narratively towards the end. The sea of red saree clad women making the final walk through the different niches of the temple is unrivalled for it absolute beauty. This might not be Bhansali’s best story telling but visually it is peerless. Shahid and Ranveer turn in fantastic performances but it is Deepika Padukone whose fire burns the brightest. The beauty, grace, dignity and pride with which she portrays the famed Queen Padmavati is one for the annals of cinematic history.